And the winner of this year's Santa Claus Rally is: Gold! A little holiday cheer there, emphasis on the word little. For in settling out the week yesterday (Friday) at 1259, 'tis a price hardly about which to be excited, the BIG reason being the above Gold Scoreboard's valuation level of 2857. But to quote Marty Feldman in the role of Igor: "Could be worse; could be raining." --(Young Frankenstein, 20th Century Fox, '74). Immediately after which came the rain. Specific to this past week, Gold toured much of The Box (1240-1280) reaching as high as 1270. Our rumination a week ago still holds that Gold likely wraps up the year inside the safety and serenity of The Box. But to unwrap the gift which finds Gold atop The Box shan't find said gift being returned to the store for exchange, (and certainly not for bits**t). 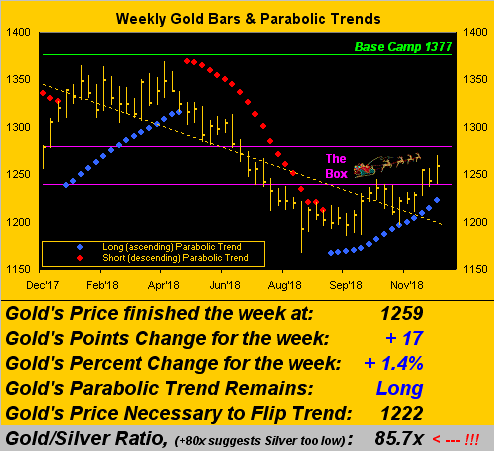 Moreover, the annoying fact of the past week was Silver's inability to keep pace with Gold, the white metal all but "unch" in gaining 0.41% versus the yellow metal's gaining 1.35%. No sporting of precious metal pinstripes early on in this holiday season for our Sister Silver, her instead being resigned to wearing her industrial metal jacket aside Cousin Copper. Further, so narrow seems Silver's trading range these days that she's not departed the 14s for 26 consecutive sessions (since 14 November). Hence the nearly record-high Gold/Silver ratio reading of 85.7x.